The type signature of crunching, also known as join is F[F[A]] => F[A]. One aspect of monoid I want to highlight here is that data type alone is not enough to define the monoid. The pair (Int, +) forms a monoid. Or Ints are monoid under addition. See https://twitter.com/jessitron/status/438432946383360000 for more on this. When List of List of Int crunches into a List of Int, it's obvious that it uses something like foldLeft and ++ to make List[Int]. But it could have been something else. For example, it could return a list of sums. That's a contrived example, but it's important to think of the composition semantics that a monad encapsulates. Option is a monad under...? Let's look at Option too. Remember the type signature of monadic crunching is F[F[A]] => F[A], so what we need as examples are nested Options, not a list of Options. Here's what I came up with to crunch Option of Option of Int into an Option of Int. So Option apparenlty is a monad under _2. In this case I don't know if it's immediately obvious from the implemetation, but the idea is to propagate None, which represents a failure. So far we have two functions join and unit. We actually need one more, which is map. This illustrates that we can define a monad without using flatMap. In actual coding, however, we tend to deal with monads by chaining flatMaps using for comprehension, which combines map and join. When writing in purely functional style, one pattern that arises often is passing a value that represents some state. The passing of the state object becomes boilerplate, and error-prone especially when you start to compose the state transition using function calls. State monad is a monad that encapsulates state transition S => (S, A). This allows us to create mini imperative style programs that can be combined functionally. Note the semantics of for is limited to one monad at a time. In the above, my hypothetical moveBlock returns State[GameState, Boolean]. When it returns false the block has either hit a wall or another block so no further action will be taken. If true do something, is like a mantra of imperative programming. It's also a code smell for functional programming, because you likely want Option[A] instead. To use State and Option simultaneously, we can use StateT. Now all state transition will also be wrapped in Option. Suppose nextBlock will place the current block at x position 1, and moving left beyond 0 will fail. The above shows that moving left-left failed, but calling right-left-left succeeded. In this simple example monad stacked nicely, but this could get hairly. Another thing I was thinking on the plane was scopt, which is a command line parsing library. One of the issue that's been raised about scopt is that the parser it generates is not composable. If the parser's type is OptionParser[Unit], then opt[Int] will also be a OptionParser[A]. This allows us to factor out some of the options into a sub-parser and reuse it given Config can be reused. Perhaps no other monads feels more fractal-like than Free monads. List and Option are fractal too, but with Free you're involved in the construction of a nanotech monomer, which then repeats itself to become a giant structure on its own. For example, using Tuple2[A, Next], Free can form a monad that acts like a list by embedding another Tuple2[A, Next] into Next like Tuple2[A, Tuple2[A, Next]], and so on. 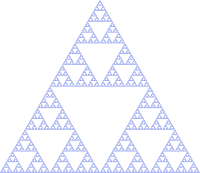 What we end up is a data structure that's free of additional context other than the fact that it's a fractal. You're responsible for destructuring the result and do something meaningful. This approach could be simpler than monad transformer. Except for the type signature, the program portion of the code is identical to the one using StateTOption. There's a bit of tradeoff on using this since we'll be responsible for implementing the context, but there's less mess on the type after the initial setup. Monads are self-repeating structure like fractals, which could be expressed as a function join: F[F[A]] => F[A]. This property enables monadic values to be composed into larger monadic values. Just like monoid's mappend, join can encapsulate some additional of semantics (for example Option and State). Whenever you find self-repeating structure, you might be looking at a monad. The composition of monadic types could be achieved via monad tranformers, but it is notorious for getting complicated. Free may offer an alternative of providing monadic DSL.